Can we merge two dot cover snapshot files (.dcvr format) that are generated with manual testing of application that doesn't have any n-unit or other test cases ? I tried to use the "merge" command line option for ".dcvr" files, but it clearly says xml parse error. I even tried exporting them to xml and creating a merge configuration xml file and tried out. So it says that merging cannot be applied on normal snapshots ? If there is a way to merge two ".dcvr" files, please tell me the complete steps. dotCover allows to merge .dcvr files from command line. 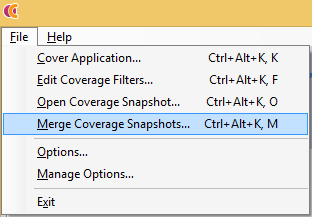 Since version 3.0 it is possible to merge snapshots from Standalone runner and Visual Studio.